The Gentle Spray Citronella Bark Collar is humane, uses no electric shock and controls nuisance barking using citronella spray! This bark collar works on dogs of all sizes. The Gentle Spray Anti-Barking Collar comes with a 30 day money back guarantee! 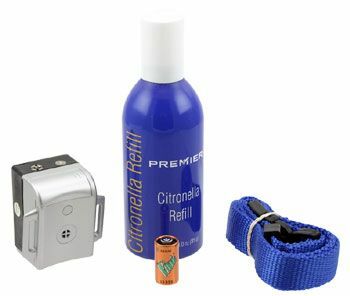 The device consists of a reservoir for citronella, a micro-circuit and microphone that triggers the spray to release citronella when the dog barks. Your dog hears it, sees it, feels it, and most importantly, smells it. Through this harmless conditioned response, Gentle Spray discourages your dog from barking. 88.9% of owner's who participated in a comparison study reported satisfaction. This bark collar was invented by veterinarians and electronics experts.